How much faster is an SSD compared with HDD drives and is it worth the price? A solid state drive or SSD can speed up the performance of a computer significantly, often more than what a faster processor (CPU) or RAM can. A hard disk drive or HDD is cheaper and offers more storage (500 GB to 1 TB are common) while SSD disks are more expensive and generally available in 64 GB to 256 GB configurations. SSDs have several advantages over HDD drives. HDD has higher latency, longer read/write times, and supports fewer IOPs (input output operations per second) compared to SSD. SSD has lower latency, faster read/writes, and supports more IOPs (input output operations per second) compared to HDD. Hard disk drives use more electricity to rotate the platters, generating heat and noise. Since no such rotation is needed in solid state drives, they use less power and do not generate heat or noise. The performance of HDD drives worsens due to fragmentation; therefore, they need to be periodically defragmented. SSD drive performance is not impacted by fragmentation. So defragmentation is not necessary. HDD contains moving parts - a motor-driven spindle that holds one or more flat circular disks (called platters) coated with a thin layer of magnetic material. Read-and-write heads are positioned on top of the disks; all this is encased in a metal cas SSD has no moving parts; it is essentially a memory chip. It is interconnected, integrated circuits (ICs) with an interface connector. There are three basic components - controller, cache and capacitor. HDDs are heavier than SSD drives. SSD drives are lighter than HDD drives because they do not have the rotating disks, spindle and motor. The moving parts of HDDs make them susceptible to crashes and damage due to vibration. SSD drives can withstand vibration up to 2000Hz, which is much more than HDD. HDD disks use spinning platters of magnetic drives and read/write heads for operation. So start-up speed is slower for HDDs than SSDs because a spin-up for the disk is needed. Intel claims their SSD is 8 times faster than an HDD, thereby offering faster boot up times. In an HDD, data transfer is sequential. The physical read/write head "seeks" an appropriate point in the hard drive to execute the operation. This seek time can be significant. The transfer rate can also be influenced by file system fragmentation and the layout of the files. Finally, the mechanical nature of hard disks also introduces certain performance limitations. In an SSD, data transfer is not sequential; it is random access so it is faster. There is consistent read performance because the physical location of data is irrelevant. SSDs have no read/write heads and thus no delays due to head motion (seeking). Unlike HDD drives, SSD disks do not have moving parts. So SSD reliability is higher. Moving parts in an HDD increase the risk of mechanical failure. The rapid motion of the platters and heads inside the hard disk drive make it susceptible to “head crash”. Head crashes can be caused by electronic failure, a sudden power failure, physical shock, wear and tear, corrosion, or poorly manufactured platters and heads. Another factor impacting reliability is the presence of magnets. HDDs use magnetic storage so are susceptible to damage or data corruption when in close proximity with powerful magnets. SSDs are not at risk for such magnetic distortion. When flash first started gaining momentum for long-term storage, there were concerns about wear-out, especially with some experts warning that because of the way SSDs work, there was a limited number of write cycles they could achieve. However, SSD manufacturers put a lot of effort in product architecture, drive controllers and read/write algorithms and in practice, wear-out has been a nonissue for SSDs in most practical applications. As of June 2015, SSDs are still more expensive per gigabyte than hard drives but prices for SSDs have fallen substantially in recent years. While external hard drives are around $0.04 per gigabyte, a typical flash SSD is about $0.50 per GB. This is down from about $2 per GB in early 2012. In effect, this means you can buy a 1 TB external hard drive (HDD) for $55 on Amazon (see external hard drive best sellers) while a 1 TB SSD costs about $475. (see best sellers list for internal SSDs and external SSDs). In an influential article for Network Computing in June 2015, storage consultant Jim O'Reilly wrote that prices for SSD storage are falling very fast and with 3D NAND technology, SSD will likely achieve price parity with HDD around the end of 2016. Increasing density: 3D NAND technology was a breakthrough that allowed a quantum jump in SSD capacity because it allows for packing 32 or 64 times the capacity per die. Process efficiency: Flash storage manufacturing has become more efficient and die yields have increased significantly. A December 2015 article for Computer World projected that 40% of new laptops sold in 2017, 31% in 2016 and 25% of laptops in 2015, will use SSD rather than HDD drives. The article also reported that while HDD prices have not dropped too much, SSD prices have consistently fallen month over month and are nearing parity with HDD. Price projections for HDD and SSD storage, by DRAMeXchange. Prices are in US Dollars per gigabyte. Until recently, SSDs were too expensive and only available in smaller sizes. 128 GB and 256 GB laptops are common when using SSD drives while laptops with HDD internal drives are typically 500 GB to 1 TB. Some vendors — including Apple — offer "fusion" drives that combine 1 SSD and 1 HDD drive that work seamlessly together. However, with 3D NAND, SSDs are likely to close the capacity gap with HDD drives by the end of 2016. In July 2015, Samsung announced it was releasing 2TB SSD drives that use SATA connectors. While HDD technology is likely to cap out at about 10 TB, there is no such restriction for flash storage. In fact, in August 2015, Samsung unveiled the world's largest hard drive — a 16TB SSD drive. Due to the physical nature of HDDs and their magnetic platters that store data, IO operations (reading from or writing to the disk) work much faster when data is stored contiguously on the disk. When a file's data is stored on different parts of the disk, IO speeds are reduced because the disk needs to spin for different regions of the disk to come in contact with the read/write heads. Often there is not enough contiguous space available to store all the data in a file. This results in fragmentation of the HDD. Periodic defragmentation is needed to keep the device from slowing down in performance. With SSD disks, there are no such physical restrictions for the read/write head. So the physical location of the data on the disk does not matter as it does not impact performance. Therefore, defragmentation is not necessary for SSD. HDD disks are audible because they spin. HDD drives in smaller form factors (e.g. 2.5 inch) are quieter. SSD drives are integrated circuits with no moving parts and therefore do not make noise when operating. 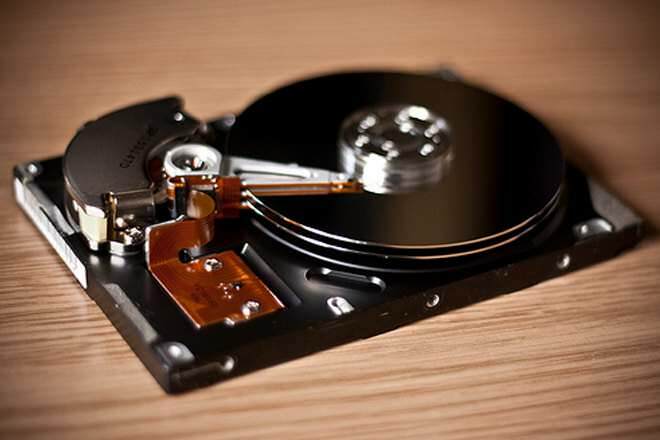 A typical HDD consists of a spindle that holds one or more flat circular disks (called platters) onto which the data is recorded. The platters are made from a non-magnetic material and are coated with a thin layer of magnetic material. Read-and-write heads are positioned on top of the disks. The platters are spun at very high speeds with a motor. A typical hard drive has two electric motors, one to spin the disks and one to position the read/write head assembly. Data is written to a platter as it rotates past the read/write heads. The read-and-write head can detect and modify the magnetization of the material immediately under it. Disassembled components of HDD (left) and SSD (right) drives. In contrast, SSDs use microchips, and contain no moving parts. 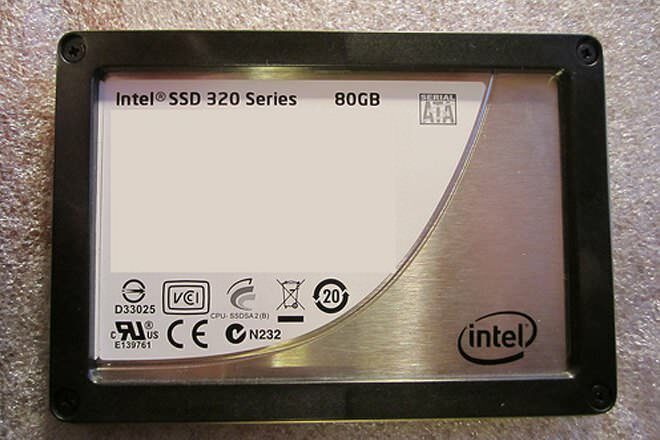 SSD components include a controller, which is an embedded processor that executes firmware-level software and is one of the most important factors of SSD performance; cache, where a directory of block placement and wear leveling data are also kept; and energy storage - a capacitor or batteries - so that data in the cache can be flushed to the drive when power is dropped. The primary storage component in an SSD has been DRAM volatile memory since they were first developed, but since 2009 it is more commonly NAND flash memory. The performance of the SSD can scale with the number of parallel NAND flash chips used in the device. A single NAND chip is relatively slow. When multiple NAND devices operate in parallel inside an SSD, the bandwidth scales, and the high latencies can be hidden, as long as enough outstanding operations are pending and the load is evenly distributed between devices. Yes, SSDs do have some limits on how many read/write operations they will support. But this is in the hundreds of thousands (or perhaps millions). And the threshold is constantly being pushed higher with new technology. So newer SSDs have a longer expected life than ones you may have bought last year. SDD (MCL) have about 10000 read write cycles! So if your OS is not optimised for SSD it will wear it quickly! Please notice how many pendrives failed when you tried to use them! There are SCL SSDs that can do 100 000 writes but these are extremally expensive. And the biggest but is comming: Retension time ! If you do not use eMCL disc for 3months it will losse all data. I think for MCL it is 1year and for SCL probably longer? SO nobody if writing how crap they are! I have install one in my laptop (no important data) and I am testing it. System boots much quicker so I even plan to install it in my desktop but only for OS and all data will be kept on HDD. So why use HDD at all? Because there's a row missing: SDD costs about 250 times as much per byte.